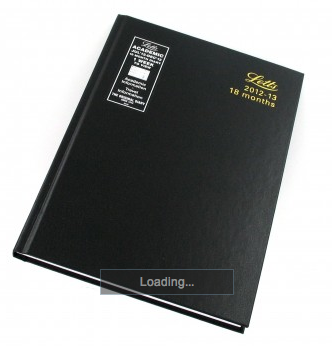 Kicking off the countdown with one of my all time favourite diaries – Letts which have a fantastic collection of academic diaries. I love their traditional ‘Letts’ plain bound diaries as they remind me of being a child (I had a letts desk diary each year to play with). However for being a student and carting the diary on the go the A6 or A5 is a more appropriate size. More recently Letts have ‘funked up’ their academic diaries by making them bright and colourful. However, I am a traditional girl at heart. On a personal level I favour the A5 week view (week on two pages). This allows me enough space to write in two columns for each day of the week. On the left hand side I write the things I am doing that day i.e. time, event and place and then on the right hand side I keep my to-do list. This means that I only have up to 8 items per day which is a manageable amount.